2016 proved to be a busy year for CT in Europe as the number of jihadi-related attacks increased and the nature of the threat evolved, with most plots involving ‘home grown’ radicalised individuals, as opposed to foreign fighters. This short analysis is a summary from a chapter published in the 2017 Counterterrorism Yearbook, published by ASPI. This article was first published in The Strategist. 2016 proved to be a busy year for CT in Europe as the number of jihadi-related attacks increased and the nature of the threat evolved, with most plots involving ‘home grown’ radicalised individuals, as opposed to foreign fighters. While EU member states have CT strategies in place, the attacks in 2015 and 2016 created a new sense of urgency. France adopted its Action Plan against Terrorism and Radicalisation in May—six months after the Paris attacks and six weeks after the Brussels attacks. Belgium’s 2015 ‘30 measures’ action plan was largely implemented, and complemented in 2016 by new measures to improve interagency coordination necessary for a federal state. German Chancellor Merkel announced her ‘nine-point security plan’ a few days after the attacks in Würzburg and Ansbach, and Germany adopted a new strategy in to prevent violent extremism. Other countries such as Sweden and Denmark had already adopted similar action plans. The unprecedented demands on law enforcement and security services led some governments to announce additional CT resources. France hired 7,500 new justice and home affairs staff in 2015–16 as part of around €900 million committed to CT, and 650 additional domestic intelligence positions were announced for 2016–17. 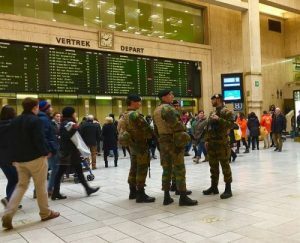 Belgium similarly pledged an additional €400 million for CT after the Paris attacks and committed to recruiting 1,000 new staff. Germany announced similar measures following the summer attacks. New CT laws were progressed in the most affected countries. The French and German judicial frameworks were amended to reinforce security services’ operational capability, including expanding the use of special investigation techniques such as wiretapping. France also introduced longer prison sentences for terrorists—including possible imprisonment in perpetuity—while Belgium is seeking to revise its constitution to lengthen administrative detention from 24 to 72 hours for terrorism. More stringent measures were taken against hate speech, with Belgium outlawing websites preaching hate and France criminalising the consultation of jihadi websites. At the EU, the unprecedented threat level enabled some major breakthroughs, particularly in police and intelligence cooperation. The G11 group of most affected countries played a key role in CT coordination. Initiated by Belgium in 2013, the G11 now meets informally before meetings of the 28 EU ministers of justice and home affairs. EU priorities included encouraging effective information sharing among members supported by enhanced data collection, improving cooperation between the European Agendas on Security and Immigration and reinforcing the EU’s external borders by establishing the European Border and Coast Guard Agency. Members agreed to enhance intelligence cooperation through the informal Counter Terrorism Group (CTG), which brings together the heads of European intelligence services. Under Dutch leadership, the group agreed to further standardise and systematise the exchange of information. The most notable operational development was the launch of the European Counter Terrorism Centre (ECTC) bringing together representatives from Europol and EU member states to enhance CT cooperation. The support for this significant development was enhanced by the perceived added value of Europol’s Task Force Fraternité, established to investigate international aspects of the jihadist network behind the Paris and Brussels attacks. In April 2016 the European Parliament adopted the Passenger Name Record (PNR) regime after more than five years of negotiations. The regime allows member states to collect and retain details of passengers on flights in and out of Europe. While member states have two years to implement the new rules, Belgium and France anticipated the EU decision by commencing work on national PNR arrangements, including extending the measure to maritime travel and, in Belgium, to high-speed trains. Questions remain, however, about the real value of this tool, and specifically how it will be used by intelligence services. A number of countries implemented laws based on UN Security Council Resolution (UNSCR) 2178 (2014), which makes it a criminal offence to travel, or attempt to travel, to another country for terrorist purposes, to provide or receive terrorist training, or to finance travel for terrorist purposes. While some states had already taken legal measures to restrict the travel of foreign fighters, countering terrorist financing became a real priority in 2016, particularly in Belgium, France and Germany. A new European Commission directive to combat terrorism was negotiated through 2016 and is expected to be adopted in early 2017. It will replace those from 2002 and 2008, and put into EU law the UNSCR 2178 elements and Financial Action Task Force recommendations. Member states and institutions also worked to develop CT partnerships with countries such as Turkey, Morocco and Tunisia. They took part in diplomatic and military initiatives, notably with the US-led anti-IS coalition. France, Belgium, Germany, Italy, Denmark and the Netherlands participate in military operations in Iraq and Syria. Home grown plots will continue in 2017, while intelligence services also fear the return of foreign fighters to Europe as IS loses its safe havens in Syria, although it’s unclear how many will come back and with what intentions. Governments understand the need for an effective strategy to deal with potential returnees and home grown terrorists, but at this stage most countries are still experimenting with different approaches to deradicalisation and disengagement.